What makes successful people-friendly places in our cities. 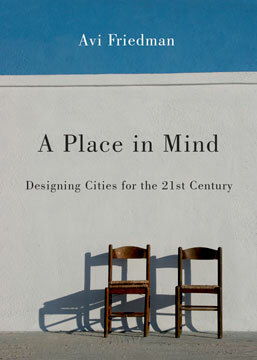 A Place in Mind: Designing Cities for the 21st Century is the result of Avi Friedman’s worldwide quest for successful environments where people congregate and feel comfortable. Whether he writes of the conviviality of a teahouse in Istanbul; the serenity of Assisi; the squatter settlements of Tijuana, or the architectural harmony of neighbourhoods in London, Friedman conveys his excitement at discovering people-friendly places—antidotes to social isolation. His search for unique spots took him to spiritual places, workplaces, towns’ squares, very cold places and warm ones. They made themselves known unexpectedly, and affected him in some way. He went on to look into their distant and near history, origins and effect on civilizations, the people that inhabit them, and above all, to reflect on what made them special. Published originally in 2010, this is a completely revised edition including new essays and photographs. Avi Friedman is a professor of architecture at McGill University. He is the recipient of several research and design awards including the World Habitat Award and the 2014 Sustainable Buildings Lifetime Achievement Award. He is the author of sixteen books, including Narrow Houses, A View From the Porch and Innovative Houses: Concepts for Sustainable Living. He lives in Montreal. 264 pp 7" x 5"